The Yorkshire Museum was the venue for a workshop on 24 to 26 June 2008. The Museum has an excellent collection of Roman inscriptions for study. A slight drawback is the distance between the museum's warehouse, where the majority of the epigraphic material is stored, and the city centre, but this is more than compensated for by the excellent conditions for running a workshop. These include a well-organised collection, abundant space for working, flexibility over opening hours, and helpful museum staff. The collection itself is substantial, with more than enough material for the needs of a workshop with a group of sixteen. We had no difficulty in finding a variety of pieces for study by individuals, or in finding material which could be used for demonstrating and practising the practical skills of drawing, photographing, and squeeze-making. All the material we used came from the warehouse, with the exception of one inscribed stone which we borrowed from the display in the museum. The collection does include two inscriptions in Greek on bronze, and one in Coptic on gold, but the pieces are small and fragile as well as very valuable, and therefore we decided not to use them. Instead, for those studying Greek epigraphy, we took a selection of squeezes. Of the stones we used for study, all could be used again with the exception of RIB 681 which has a friable and fragile surface. 15.00-15.30: Plenary session: "Making the Most of Museum Time"
16.30-17.00: Tea & cake, students introduced to personal inscriptions. 18.00-19.00: Plenary Session: "Working in museums in Britain and overseas"
09.00-10.00: Practical sessions in two groups: A: drawing; B: squeeze-making. 17.30-19.00: Public lecture: Richard Grasby: "How to Make a Roman Inscription"
I was most fortunate to be amongst those selected to participate in the British Epigraphy Society's second Practical Epigraphy Workshop, held at Yorkshire Museum, York, 24-26th June 2008. 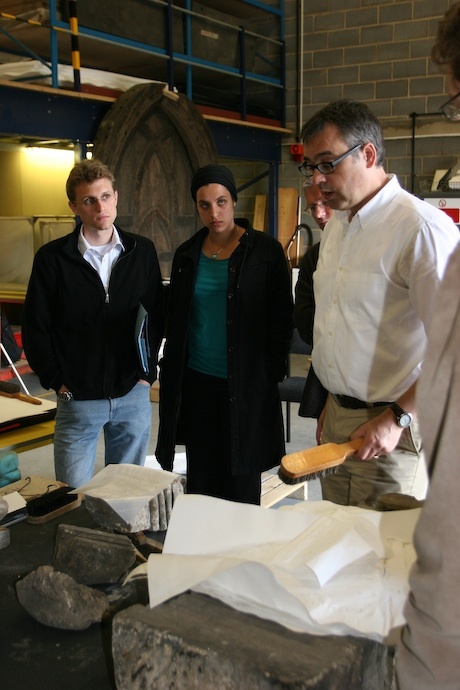 This gave participants the rare opportunity to develop hands-on skills in working with epigraphic material amongst experts. With specialist tuition from four dedicated instructors, Charles Crowther (Oxford), Graham Oliver (Liverpool), Roger Tomlin (Oxford), and Charlotte Tupman (KCL), the participants gained direct experience of the practical elements of how to record and study inscriptions before presenting their findings. The programme included the making of squeezes; photographing and measuring inscribed stones or squeezes; and the production of transcriptions, translations and commentaries. Participants, from across Europe, were given the choice to work on Latin or Greek texts. Several UK students were awarded generous bursaries to assist with the costs and we all benefited from some form of direct or indirect sponsorship by The British Epigraphy Society, The Roman Society, The Classical Association, Classics in the Subject Centre, and Axtell Perry Symm Masonry Ltd, Oxford. I should especially like to thank the organisers Peter Haarer and Charlotte Tupman and the Curator of Yorkshire Museum, Andrew Morrison, and his staff (particularly Katherine Bearcock). In advance of the workshop, the Greek texts could be previewed with images of the stones concerned very kindly uploaded by Charles Crowther on to the web. Latin texts were to be found in Collingwood & Wright, The Roman Inscriptions of Britain (2ed.). Each participant was assigned an inscription in their chosen language. We were asked to complete some preparatory reading and assigned a text with a problem to clarify through autopsy of a squeeze (Greek option) or stone (Latin option). Before the workshop started officially we were treated, by Roger Tomlin, to an additional informal walking tour of the inscriptions on display in Yorkshire Museum during which Roger deployed his all-embracing knowledge about some magnificent inscriptions on truly wonderful monuments. Then, during a rare June 2008 sunny afternoon spell, we assembled in the beautiful Museum Gardens for registration, introductions and group photographs amongst the atmospheric abbey ruins. Afterwards we were transferred to Yorkshire Museum's purpose built store to start the practical sessions for which were divided into two groups to work in parallel. During the workshop we were all expertly instructed in epigraphic squeeze-making, photography, and drawing, punctuated with generous helpings of tea and cake besides delicious sandwich lunches. The instructors and organisers informed us about the practicalities of epigraphic study in museums in Britain and overseas and how to make the most of one's time once granted permission to do so. It became apparent how valuable it is to handle the original stone artefacts as this reveals details not always visible in two dimensional publications (e.g. mouldings to the side or top of a text). The first evening was rounded off with a convivial course dinner in York's impressive Assembly Rooms. 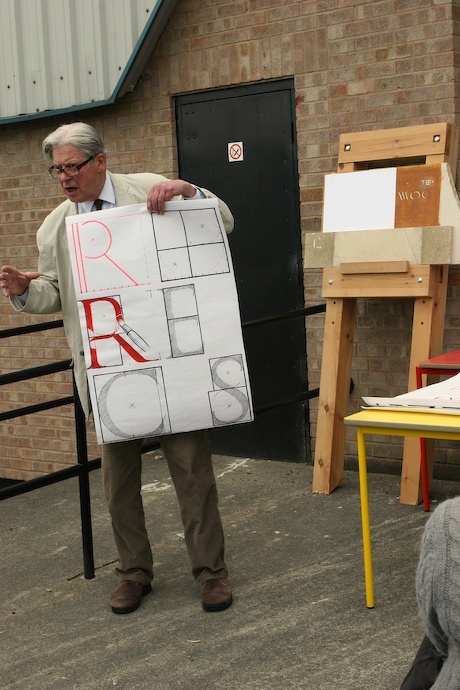 On day two, in between practical sessions, we were fortunate to have a demonstration of carving an inscription by Richard Grasby and many of us jumped at the chance to practice carving a letter which is much easier said than done. One also finds it easier to appreciate the purpose of serifs after having attempted to carve and finish off a letter which adds to one's interpretation of epigraphic texts. Richard Grasby also gave a well-received public lecture at the Yorkshire Museum on the second evening on "How to Make a Roman Inscription". Afterwards four of York Minster's masons were especially pleased to be able to meet and discuss carving with Richard. After instruction in the basic techniques, we studied our assigned texts and collected the basic information required to prepare our presentations. We identified the particular problem of each text that could be resolved through autopsy. The presentations were held on the last morning and included a brief summary of each of the inscriptions which participants had been given to study (provenance, date, contents, significance), a summary of the problem and the effect of different readings as well as what our study of the squeeze or stone contributed to the resolution of the problem. We are producing written versions of our presentations for inclusion in a web-site. Overall, it was a thoroughly useful and enjoyable workshop. Many new friends and colleagues were made and I am confident that the written presentations will make interesting reading. Once again, a big thank you to all concerned.